Photo of: East Coast of Ireland: Meath: Loughcrew. A view at sunset from the top of the large Neolithic burial chamber on top of Carnbane East at Loughcrew. At the foot of the large tumulus is a smaller one surrounded by a stone circle, as can be seen in this photograph. 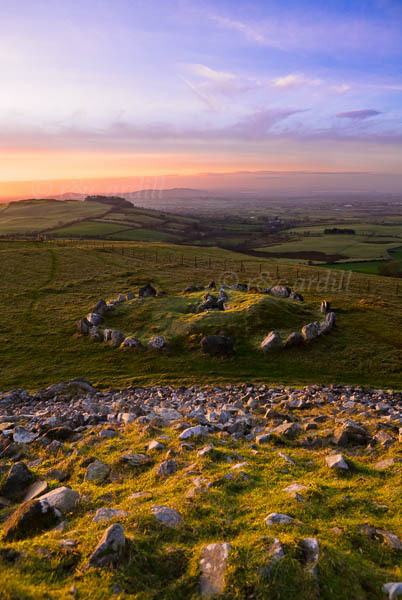 The Loughcrew cairns are located 40 kilometres from Newgrange, situated on three hill summits near the town of Oldcastle. The hills, Carnbane West, Carnbane East and Patrickstown, are known collectively as Sliabh na Caillighe, or the Mountain of the Witch . The burial chambers are probably older than Newgrange, dating to between 3500 and 3300 BC.